The Table is located behind Tate Modern and the hustle and bustle of the Southbank. Head chef Shaun Alpine-Crabtree brings an impressive pedigree and a fresh take on modern dishes. 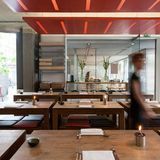 "One of London’s best-kept secrets, The Table Cafe is a chic little eatery located a stone’s throw from Tate Modern, the South Bank and Borough Market. With a clientèle made up of local residents, business people, architects and artists, the clean, modern space bustles from dawn till dark. From the sleek open kitchen comes an eclectic mix of modern British cuisine, expertly prepared using locally sourced ingredients and complemented by a seasonal wine list." What did you think of The Table? I end up having my lunch in The Table every day, I think it's quite good, they do good salads and it is good value for money. I'd recommend the brown prawn bap at The Table, perfect! I recently went to a private party at The Table for a friends party, we all had such a fab night! The food was spot on & there was a great choice of drinks. I cant wait to return. I usually pop in here after a wander round the tate coz I really like the clean cut, modern style that this restaurant has. The food has always been good, though hasn't ever blown my socks off! And it makes for a nice meal out. I don't think it's the kind of place I'd go on a date to, but it is perfectly suited for a casual dinner with the mates. Nice food, nice area, nice prices! Went for my girlfriends birthday meal at The Table, the meal was lovely and the wine list was fabulous and cheap, a great way to spend it and nice and romantic despite the loud atmosphere. Went to The Table for a quick lunch with my friend, it was in a really easy central area on the south bank and had a lovely atmosphere and finesque. Not too expensive either! The Table is a perfect all rounded restaurant really. I’ve done both breakfast and dinner at this place and haven’t been disappointed at all. 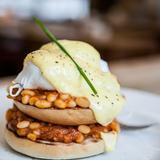 I definitely recommend the Borough Full English to push away those Monday morning blues! 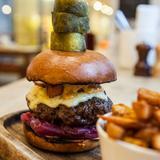 But if you’re heading out for dins then my fave dish is the Table Ranch burger, purely because its massive! I honestly would recommend this place to anyone! What a lovely surprise, The Table, whilst looking very basic and unassuming, served us up some of the finest food I have tried in London. My wife was equally pleased and we commended the waiting staff for their outstanding service. The food was a little expensive but it was completely justified by the great quality. Will definitely go back! What a great place, we always try to get a booking there when we are in town as it's out of the way but still worth a trip down to get there. I really love the selection of food and drinks and they do a grand job putting it together and the presentation is lovely. What I really like here at The Table is that you can pick and choose how many dishes you want dependent on how hungry you are. The Tuscan sausage small plate has to be my favourite here, really delicately spiced I can't get enough of the stuff! If you are in the Southwark area give this place a try. Stop by after friends said yes lets go out but gave short notice, i remember dinning out at the The Table a couple of years back when it did British food, now Italian with the new chef from Zucca. The food was excellent with the peas fresh and with flavour or al dente as my wife would say, they only dropped a star for a knackered door, and service, although i was facing the wrong way, but a great night out had by all! I didn't realise that The table opened in the evening, I have only being along for a Sat breakfast, so last night was nice surprise. I love the attention to detail like the water jug, your have to go to see what I mean, and the service was excellent, thank you Rachel! It has a really nice atmosphere with a nice mix of people and kids (well behaved kids at that!!) The food and wine was fresh and busting with flavour, i loved the leek, snail, and chorizo. All together one of best evenings I have out in a long time! Food – Perfect temperature when brought to the table. Decent size dishes and full of flavour. Venue – Good furniture I felt very relaxed a little at home even. Staff were helpful when it came to finding us the best table for the size of our group. Staff – Smart and polite, could have been quicker with the drinks but the excellent service for the food made up for it. Recommend? – Yes I would was great for our family meal and friends of mine have since visited and agreed. The Table was worth the visit. Very comfortable place to eat felt very relaxed with such a good atmosphere around you. The food was nice enough and staff were very nice. Clean and helpful. If I was in the area again I would return, not the biggest of size dishes but defiantly worth the price you pay at The Table. The Table was so good for money and honestly the food was better then many other restaurants in the area which I have tried. 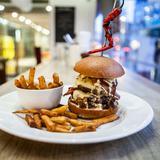 I and two other friends all said we were so impressed by the food, money, service and the atmosphere. Well done to The Table you have got a big fan here! Had lunch at The Table and they were very helpful for changing the dishes for the kids and the food was divine! Service was great especially with the children who weren’t exactly quiet. Will be returning! The Table is in a great location by the Tate and the staff are very nice & helpful, but our meals just took a bit too long to arrive. If your ever in Southwark, you should try the breakfasts at The Table, they are just delicious! My girlfriend lives in Southwark and we always go to The Table when we're looking for some brunch to soak up our hangovers. The Table always comes up trumps, and while it doesn't always get rid of them, it helps. Speaking to The Staff at the Table and they really do know about their food, which is definitely a big plus when it comes to recommending somewhere. It's still not (yet) perfect but the Table remains one of my places to visit if I'm training it from Waterloo. I came here on a pre hen party out for dinner and drinks, and I have to say the staff were efficient, but there was a slight lacking in service with a smile. Nevertheless by the time we left we were too drunk to notice! The food I have to say was so lovely though, a real treat. I had fish cakes with salmon and oh my, the salmon was so tasty and the whole dish was just amazing. I want to bring my husband here sometime very soon! So glad that we discovered the Table. The food is excellent, the location perfect! Perfect for the family or just the two of us - we will definitely be back. The Table is without a doubt one of the best restaurants in London. I've met the chef, Shaun, a few times and he is as enthusiastic as you would imagine him to be. Get a table at The Table and enjoy - you seriously will. yeah the food is all alright but if I'm being honest I've had better, The Table is good for lunch I suppose but it's not in a particularly great area and a bit out the way to trek to for dinner. GO HERE if you are in the Southwark area, food is so good and defo worth a try!! Love The Table! Really like that The Table serves food until 11pm on Friday, came for a late dinner after an business meeting last week and had a really decent meal. Nice to see that the standard here doesn't diminish after a certain time. Really good location if you are visiting the Tate Modern, the food is pretty special here at The Table. Always drop in for a bite to eat if I'm in the area. The brekkie is pretty dapper here, came the other morning and was actually impressed with the quality of the food. The Borough Full English was the only way to go here at The Table! Have been to The Table on a few occasions and have thoroughly enjoyed everytime I have been. The dinner menu is better then the lunch menu in my opinion, the Duck leg confit has a really nice flavour and the mustard adds a a really great heat to it. well worth a visit if you are in the area. Has the three course lunch here last week with a friend, we were both really overly impressed the with quality and standard of the food. If you are thinking of going I'd recommend the ranch burger for main and Chocolate brownie mousse for dessert, both so good! Came for lunch at The Table yesterday after a visit to the nearby galleries and just wanted to commend the chefs for truly exceptional food. I had the salmon fish cake which is honestly one of the nicest I have ever tasted, really nice flavour and presented beautifully. Will definitely be returning here in the future that's for sure. Visited Table for breakfast one morning and was (for once) glad to be out of my bed. I had the Eggs Royale which was by far the nicest Eggs Royale I've had since I moved to London. The food came out rapidly, and was complemented nicely by a hot cup of coffee. Top marks, I will certainly be getting up out of bed in time for a Table breakfast.